It’s hard to deny that peanut butter and chocolate make one heavenly combination. 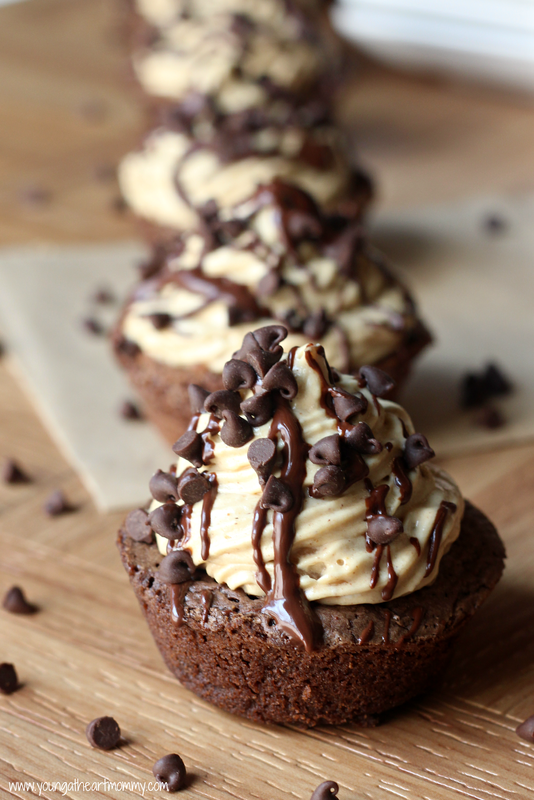 I’ve found that some of my favorite desserts are made with both of these ingredients, including these Decadent Chocolate Peanut Butter Cupcakes I shared last year. Through my passion for baking I have come to learn that peanut butter isn’t just for sandwiches. That’s right jelly, I’m talking to you. Move on over because there’s a new dynamic duo in town. Today we appreciate the ooey gooey glory that is known as peanut butter and it’s true partner in crime, chocolate! 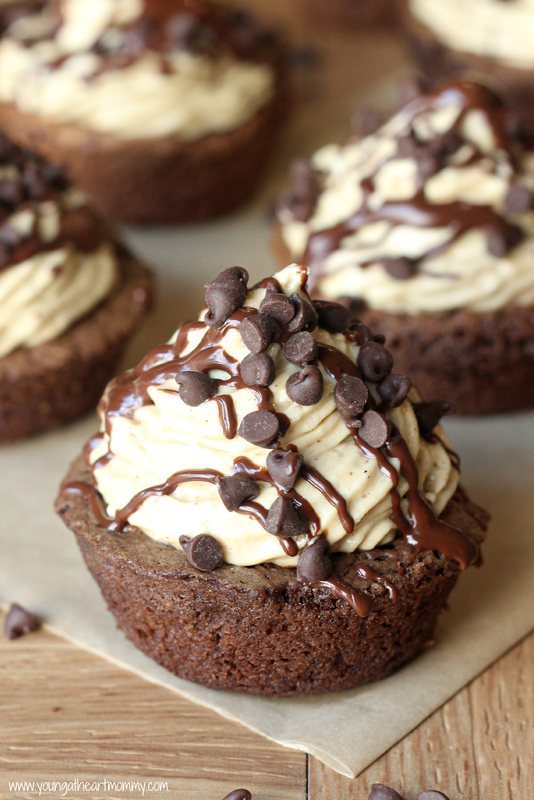 These Peanut Butter Mousse Brownie Cups will confirm that these two make the perfect pair. 1. Preheat oven to 350 degrees. Spray cupcake or muffin pan evenly with cooking spray. 2. Prepare batter by combining brownie mix, water, oil, and eggs. Follow the instructions printed on the back of the box. Bake for 10-15 minutes. Allow to cool and pop brownie cups out of the pan. 3. Using an electric mixer beat cream cheese and peanut butter together until well blended. Add in powdered sugar,vanilla extract, cinnamon, and salt. In another medium sized bowl beat heavy whipping cream until stiff peaks form. Fold into peanut butter mixture. Transfer mousse into piping bag and refrigerate until you are ready to use. 4. 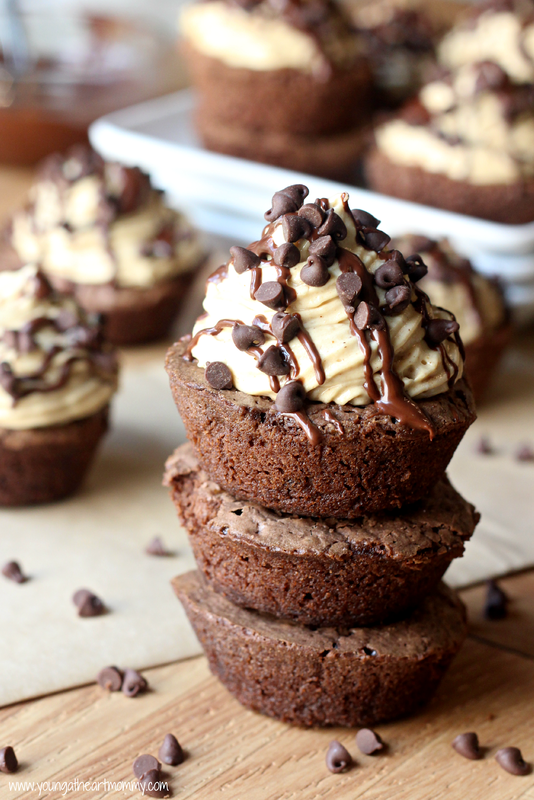 Assemble brownie cups by piping peanut butter mousse on top. Melt 1/2 cup of chips and drizzle on the melted chocolate. Sprinkle remaining mini chocolate chips on top. These chewy brownie cups topped with creamy peanut butter mousse will not only please your taste buds but also a lingering sweet tooth. You’re getting two desserts in one bite! Can you imagine a better way to combine both of these incredible flavors? You just can’t go wrong when chocolate and peanut butter join forces while helping to create a decadent dessert in the process. What’s your favorite peanut butter and chocolate combo? Oh Dear God! I must make this...like know. I adore pb & choc in any form! 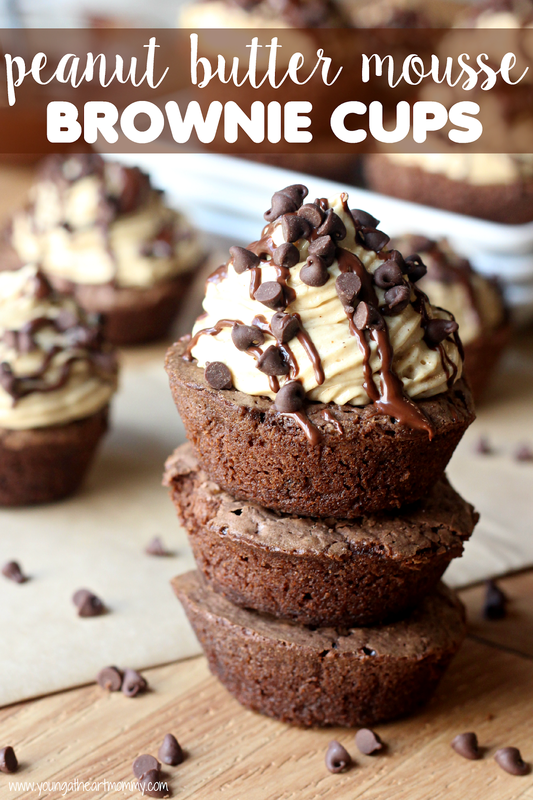 what a terrific way to use a brownie mix- these are spectacular!!! Peanut butter and chocolate are my favorite sweet pairing. I'd love these for the holidays.